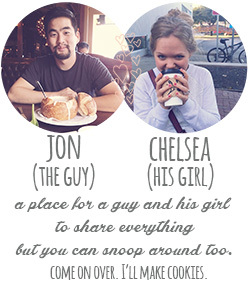 A place for a guy and his girl to share everything. 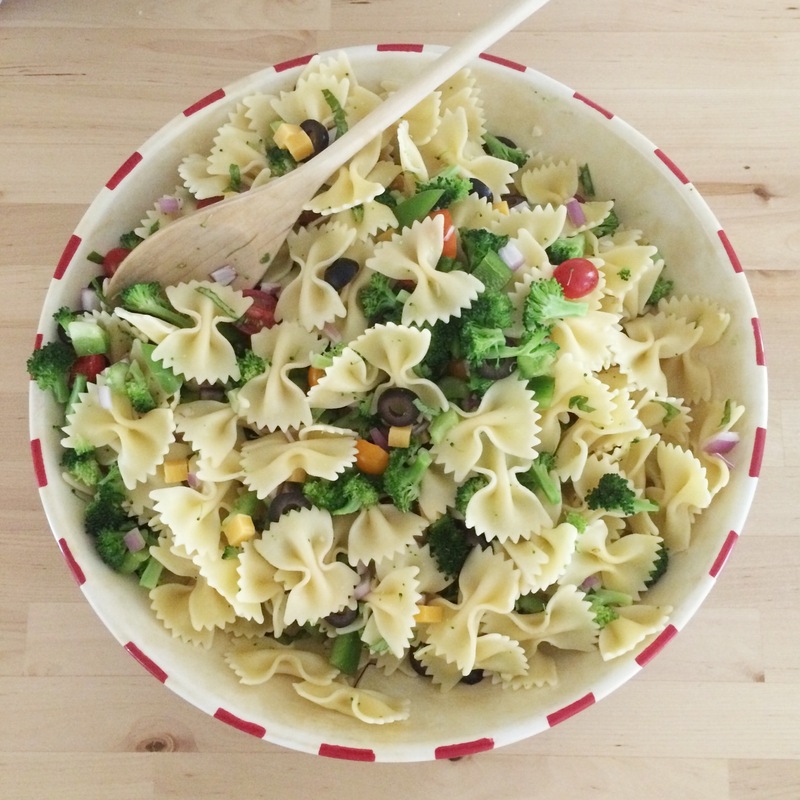 In the kitchen: The world’s biggest bowl of pasta salad for a summery Sunday dinner. Outside: We sadly lost part of a big tree in the storm. Our shade will be missed, but the garden will be happy with a touch more sunshine. Reading: Be Your Own Herbalist. For using all the herbs growing in the garden. The worst bedtime chore: Filling the humidifier. Whoever designed it clearly never tried to do it while also holding a tired baby. Enjoying: Our weekly box of farm veggies delivered to our door. It’s like back in the day when the milkman came. And they also bring us eggs, and meat, and coffee, so it’s kinda the best. 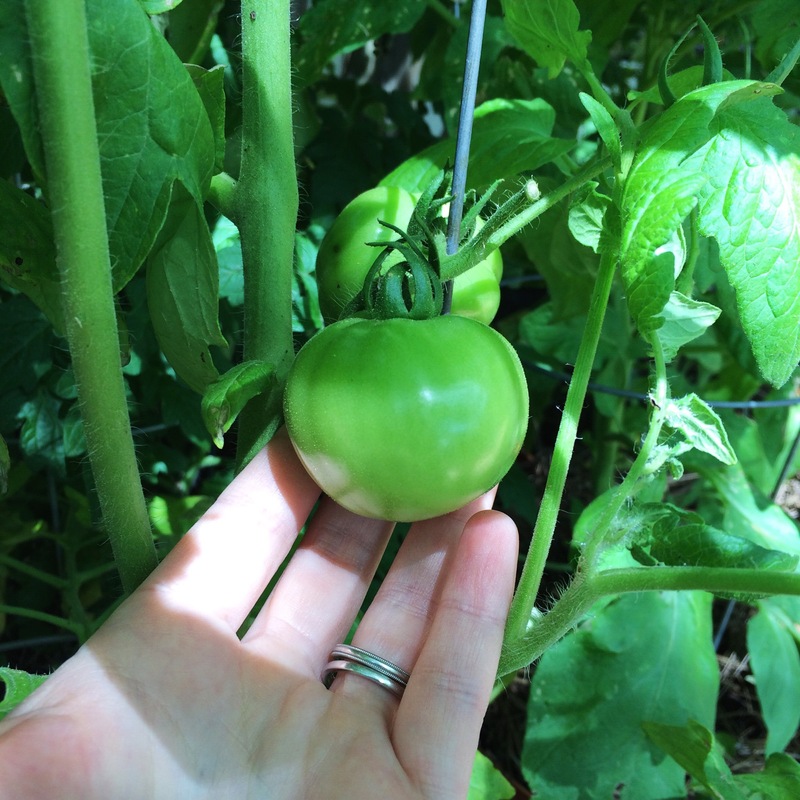 Hoping: Our biggest tomato will be ready soon! We have bacon in the fridge just waiting to be a BLT! This entry was posted in Life and tagged Food, garden, Life on May 3, 2016 by Chelsea. 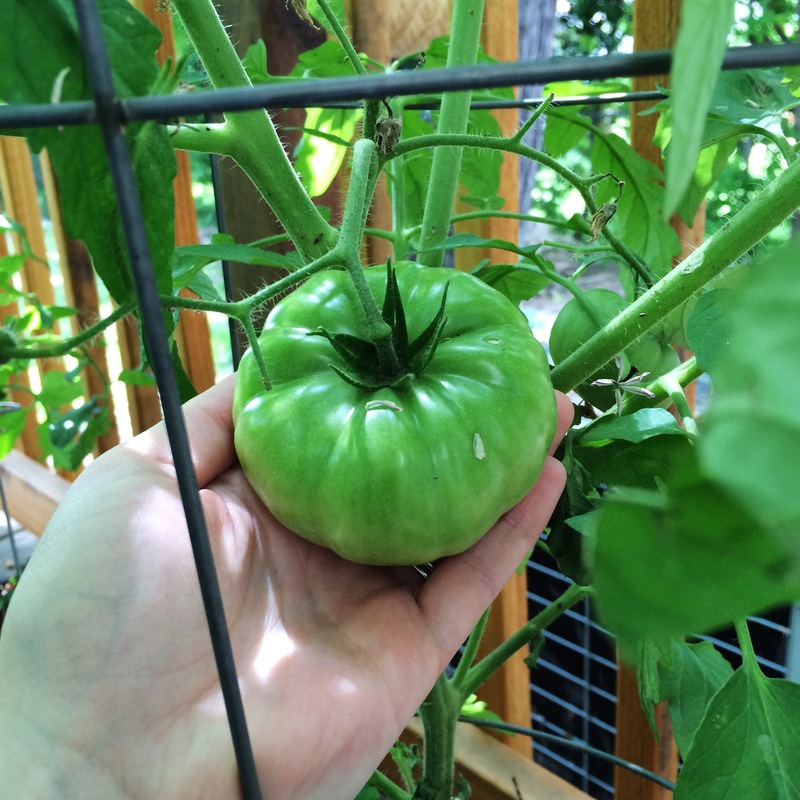 I hope this doesn’t jinx us… But look at these huge tomatoes! We’ve got quite a few growing out there, and we bet they are going to get some color any day now. This entry was posted in Life and tagged backyard, garden, gardening, grow, tomatoes, vegetable on April 15, 2016 by Chelsea. We celebrated the chilly temperatures with a little fire! Jon made the fire while I pushed the stroller around and around. Once the fire was going, and a nap was achieved, we enjoyed some toasty s’mores together. An excellent afternoon date in the backyard. And those jumbo marshmallows- so big! Delicious, but comically large. 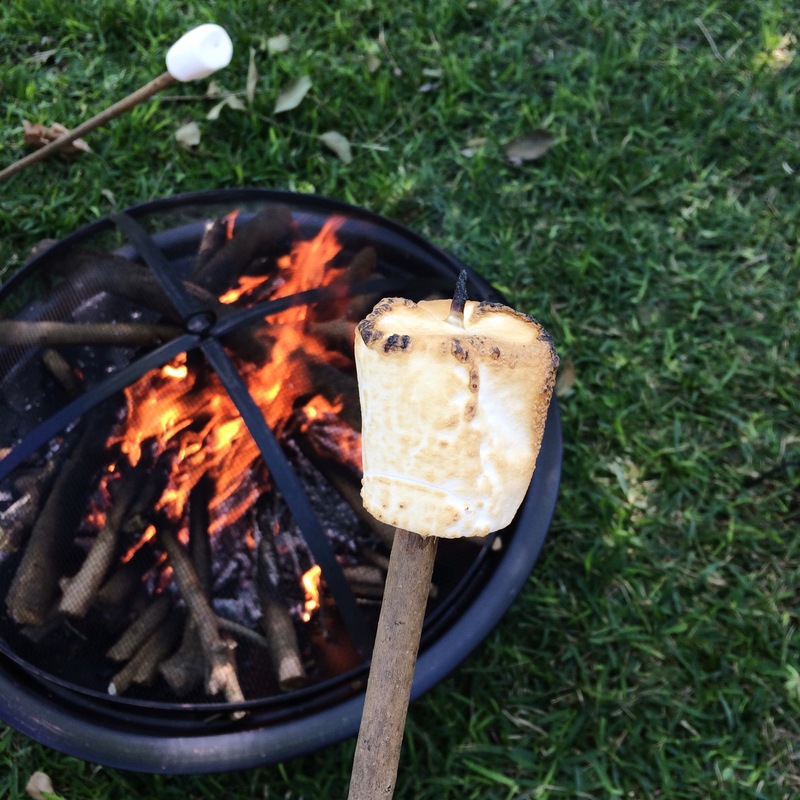 This entry was posted in Life and tagged backyard, fire pit, garden, s'mores on March 24, 2016 by Chelsea. 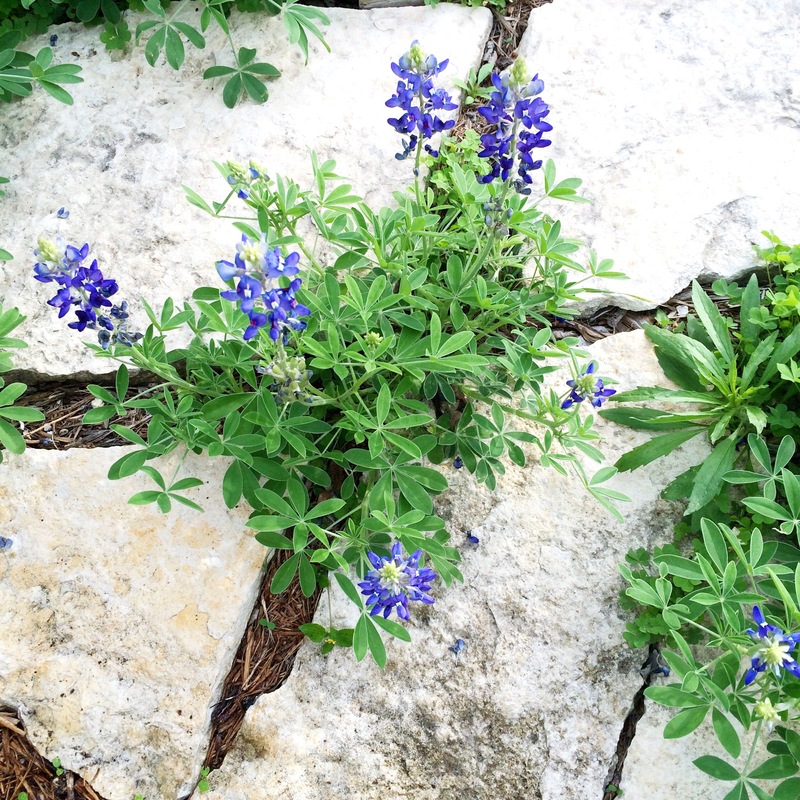 Outside: Our bluebonnets are overtaking the driveway. Growing between rocks and such, and looking all springy. In the kitchen: We made this pasta with all our extra chard, and it’s delicious. We added a bit of extra cheese, and some breadcrumbs to the topping. Making: An Easter surprise for the little guy. Although if we stuck the TV buttons in a basket, he’d probably love that all the same. On blast: Cabbage worms. They went after our kale plants like the very hungry caterpillar. I picked off 10 one evening, but only 2 the next, so fingers crossed they hit the road. On the lookout: For more chard recipes, a little bench for our front porch, those chocolate mini eggs, and more hanging flowers. This entry was posted in Life and tagged chard, garden, Life, recipes, swiss chard on March 22, 2016 by Chelsea. Finally! 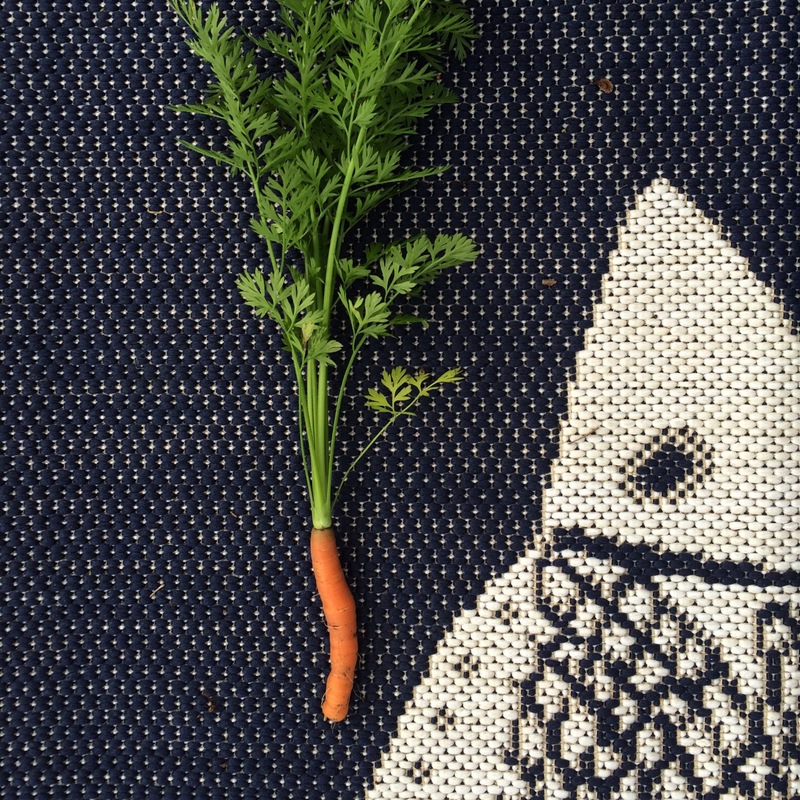 After several seasons of trying, we’ve successfully grown an edible carrot! And just in time for the Easter bunny. I’m planning on picking them all within the next week or two, to make way for pepper plants. What should we make with them?? I’m gonna try baby food, maybe roasting a handful, or just eat them plain. They smell so super carroty! This entry was posted in Eat, Life and tagged backyard garden, carrot, Food, garden, grow, vegetables on March 21, 2016 by Chelsea. 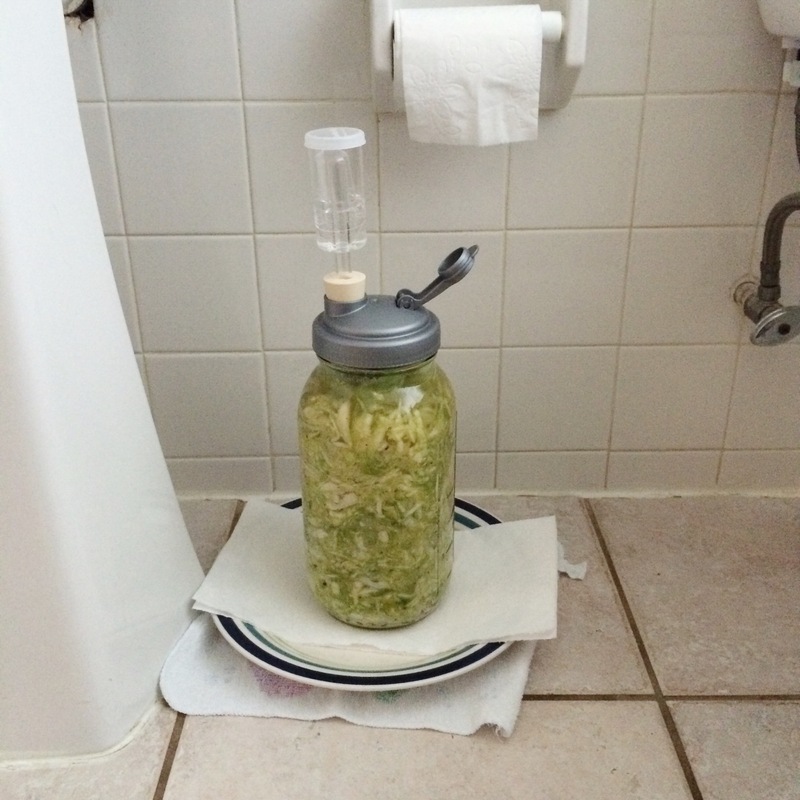 In the kitchen: Fermenting a cabbage leek sauerkraut. Our bathroom tiles stay fairly cool, even when it’s warm out, so this is our fermenting spot. On TV: We just watched The Martian. We both enjoyed it. Jon read the book too, so he had to point out all the differences. Making: Some more dishcloths because they are an easy project to stop and start. I just got some fabric to finish a quilt, so that’s my next goal after teething season. On the lookout: Baby B is definitely a mover. He doesn’t formally crawl, but he can get where he wants to go, and pretty quickly. Wanting: To find some patio furniture for the deck. So we can sit and eat our tomatoes. 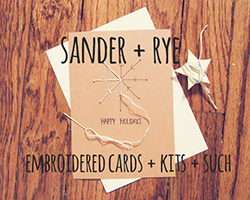 This entry was posted in Life and tagged fermented food, garden, home, sauerkraut on March 7, 2016 by Chelsea. I planted some radish seeds in the garden a couple months ago maybe. The garden website said I could, so I gave it a shot. Might have needed more water/sun/whatever, but still kinda cute. We pulled them up to make room for more greens, but I’m trying one more batch of radishes in a planter. Never surrender! 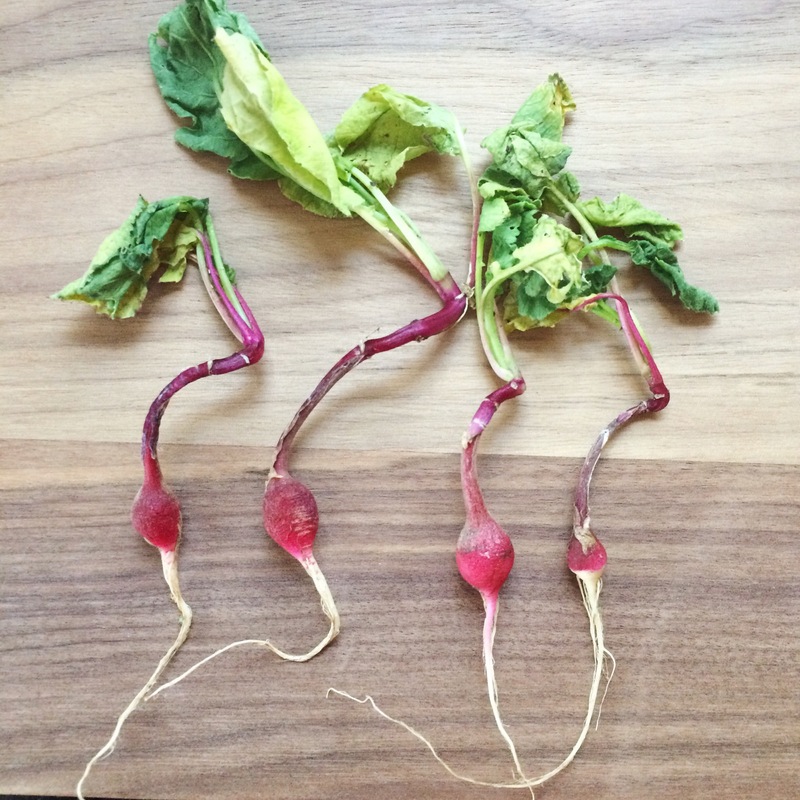 This entry was posted in Life and tagged backyard garden, Food, garden, grow, radish, vegetables on March 4, 2016 by Chelsea.